One of the scariest scenarios drivers and passengers can experience is being trapped inside a car when flood suddenly covers the streets. If you have no knowledge of how to handle this situation, your predicament would be so much worse. Should you stay inside until help arrives? Or, is it necessary for you to go out immediately and find help? Since there are a lot of possible solutions, some of which are completely wrong, we are here to guide you on what to do in a flood when you are inside a car. Just a bit of advice before we proceed on what to do in a flood: never underestimate shallow waters. 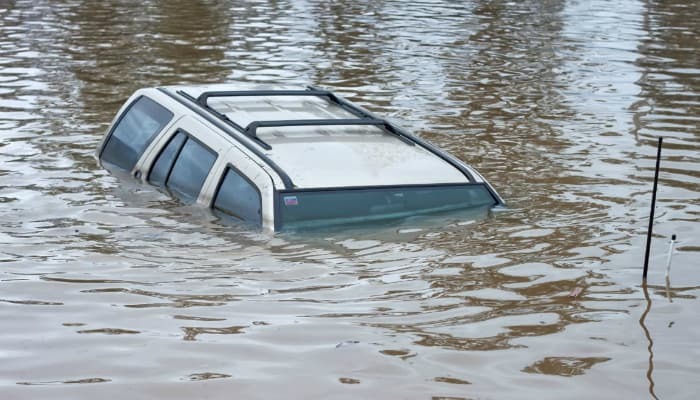 Based on a certain natural hazard guideline released by the Federal Emergency Management Agency, six inches of water can already contribute to a steering failure, making it hard for you to control your car. Meanwhile, one foot of water can surprisingly make cars gradually float away. Lastly, two feet of water is enough to quickly sweep away vehicles – even big ones such as SUVs and pickup trucks. DO NOT SECURE YOURSELF INSIDE. Ironically, you have to be 100% free from any constraint inside the car. We are specifically referring to your seat belt. Do not believe the notion that the seat belt would keep you safe when the vehicle starts floating away. After all, once the car floats, you are already in big trouble. As soon as you see water surrounding your car, stop the vehicle and release yourself from the seat belt immediately. Also, unlock all doors. If there are authorities nearby, they can easily open your car door and save you. If you are simply wearing two pieces of clothes, top and bottom, disregard this tip. However, if you are wearing a jacket and other types of layers, immediately remove them all. This initiative keeps you from sinking if you have to swim. Now, let’s start thinking about worst-case scenarios. What if you are stranded in the middle of the flood without safety personnel around you? Before you even get to this point, it is always a good idea to stay indoors whenever it rains. However, when push comes to shove, lower one window but not in an abrupt way. Just do it slowly. As long as the car is not yet underwater, electric windows usually work even in a flood. Once you successfully lower the window, climb out straight away. Find a high ground and contact 911. GO TO PLAN B IF YOU CANNOT OPEN A WINDOW. Worse, there is a possibility that you cannot open the windows anymore, especially if they are electronic ones. So, you have to resort to car doors. Forget about the passenger compartment getting wet. That is the least of your worries in emergency situations. If you are too weak to open the car door, break a window. Make sure to bring a glass breaker with you at all times. It is hard to forcefully shatter a window inside a compact space if you use other tools. Just a heads-up, these tips are only applicable if the water is still at low level. Of course, you may suffer from wounds when you climb over a shattered glass window. However, your number one priority is to keep breathing. Wounds are nothing compared to drowning. Unfortunately, car doors are impossible to open when the water level is already too high. Why? Two words: water pressure. You cannot open a car door if there is massive pressure outside. A solution is to equalize the pressure between the inner and outer part of the car. To achieve this, there is nothing left for you to do but wait for water to fill your car. Hold your breath once submersion is complete and open the door at once. That is why we told you to unbuckle your seat belt, unlock the doors, and avoid waiting for water to rise up unless the car is already submerged. As you can see, not only do you have to take driving lessons. Knowing how to swim is essential. Water pressure is also the reason why you cannot break a window during your car’s submersion. The explosion of shattered glass will severely hurt you. Unless the water level is still low, forget about your belongings inside the car. You cannot swim properly if you are busy carrying your bag. If you can still walk on water, prioritize your phone so you can call for help anytime. DO NOT SAVE YOUR CAR. Just because you can still stand on water does not mean you can push your car towards a safe place. The main reason why we are advising you to get out of your car immediately is to find a high ground. Flood can still rise to an extreme level so better avoid that pronto. So what if your car is expensive? As a car owner, you should be totally updated about storm signals. LET THE AUTHORITIES TOW YOUR CAR. When the flood finally subsides, do not go back to your vehicle. 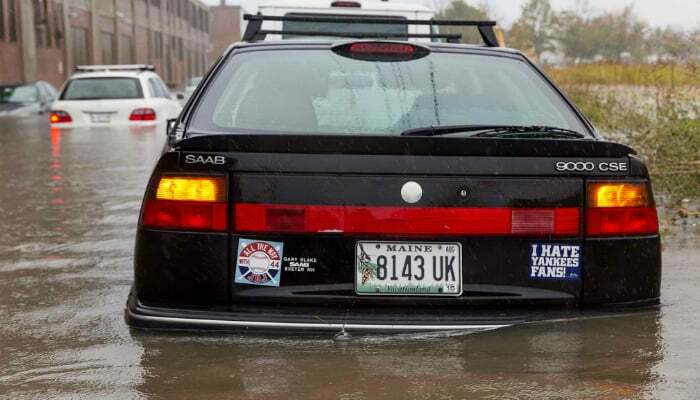 You might use a lot of time starting or pushing your car until the water level rises again. Besides, emergency personnel always use proper means of taking cars to a safer place. In summary, the first solution is to keep calm. When you are calm, your mind easily remembers what to do in a flood when you are inside a vehicle. Your main goal is to get out of the car and go to a higher place if there are no authorities around. Never wait for the water level to rise up. In case you haven’t noticed from our guidelines, the solutions progress from the easiest ones to the worst-case scenarios. Do not let yourself be exposed to a more dangerous situation. Lastly, always catch up with weather updates and learn how to swim – just in case. A Reactivity Controlled Compression Ignition engine can achieve 60 percent thermal efficiency. That’s incredible. As Mazda and Infiniti have proved, there’s a lot of innovation left in the internal-combustion engine. One of the more wild concepts we’ve seen is called Reactivity Controlled Compression Ignition (RCCI), and it could just be the holy grail of internal combustion. Why? It uses gas and diesel to achieve incredible levels of efficiency. This engine only lives on a test bench now, as Engineering Explained’s Jason Fenske details. It’s a concept developed by the University of Wisconsin-Madison that in lab testing has achieved 60 percent thermal efficiency. That means this engine is converting 60 percent of its fuel used into power rather than waste energy—a much higher number than any automotive engine in production today. For context, Toyota has a new 2.0-liter four-cylinder that achieves a remarkable 40 percent thermal efficiency, while Mercedes-AMG’s F1 power unit achieves 50 percent. An RCCI uses two fuel injectors per cylinder to mix a low-reactivity fuel, like gas, with a high-reactivity fuel, like diesel. Theoretically you could mix any low- and high-reactivity fuels for RCCI to occur, but gas and diesel is perhaps the most interesting combination. The combustion process is quite fascinating. First, a mixture of gas and air enter the combustion chamber, then diesel is injected. The gas and the diesel start to mix as the piston moves up towards top dead center, at which point, a little more diesel is injected for ignition. This engine is more fuel efficient than a conventional diesel engine, and it’s much cleaner too. It sounds like the ideal internal-combustion engine, so that might make you wonder why it’s not yet in your car? Well, the engine is still very much in development, so if it ever were to enter mass production, it wouldn’t be for some time. There’s also the whole issue of having to equip a car with two entirely separate fueling systems. Researchers at MIT have developed a system they hope will correct one of self-driving cars biggest blind spots: country roads. A new system called MapLite is capable of self-driving without the need for 3D-mapped roads, making it uniquely suited for tackling more rural areas. For the most part, self-driving car tests have focused on cities. Boston, Pittsburgh, Las Vegas and dozens of other cities have begun or plan on beginning self-driving pilot programs. There are reasons that companies look at cities. Cities generally have clear signage and well-maintained roads, two things that make the huge challenge of AI driving a little easier to break down and tackle. Companies like Google or Uber also invest in complex 3D-mapping for these urban areas, labeling each and every road sign and lane. Given the complexity of the operation and the fact that millions of miles of U.S. roadsare unpaved, unlit, or unreliably marked, it’s no wonder the development focus so far has been decidedly urban. That’s something MIT’s Computer Science & Artificial Intelligence Lab (CSAIL) wants to change. Rather than relying on 3D mapping, MapLite focuses its efforts on satellite mapping like the kind you can find on Google Maps, and a series of LIDAR and IMU sensors. The system then creates two goals: a final destination and a “local navigation goal,” in view of the car. The LIDAR then estimates where the road begins and ends. Without sign markings, the LIDAR makes basic assumptions that the road will be relatively more flat than the surrounding areas that are not road. “The reason this kind of ‘map-less’ approach hasn’t really been done before is because it is generally much harder to reach the same accuracy and reliability as with detailed maps. A system like this that can navigate just with on-board sensors shows the potential of self-driving cars being able to actually handle roads beyond the small number that tech companies have mapped,” says CSAIL graduate student Teddy Ort, who was a lead author on a paper about MapLite, in a press statement. The system was tested around Devens, Massachusettes, a census-designated area in central Massachusettes with a population under 2,000. Driving a Toyota Prius around on multiple unpaved country roads, the CSAIL team was successfully able to self-drive and detect the road more than 100 feet in advance. The system isn’t perfect yet. It’s best equipped for forest-type environments like those around Devens, it can’t handle a mountain road due to their dramatic changes in elevation. But the successful test is a first step, researchers hope. “I imagine that the self-driving cars of the future will always make some use of 3-D maps in urban areas. But when called upon to take a trip off the beaten path, these vehicles will need to be as good as humans at driving on unfamiliar roads they have never seen before. We hope our work is a step in that direction,” says Ort.